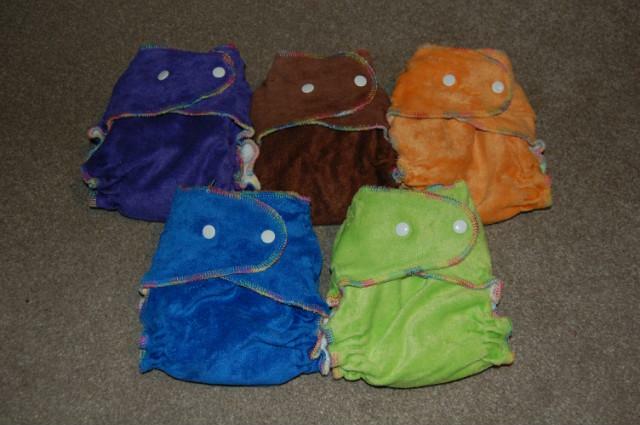 As shown above, "large" size bamboo velour nappies with T-shaped inserts. Very absorbant, colour safe and lovely and soft. I bought these new myself when I had two kids in cloth but DD potty trained not that long after and I now have far too many nappies for one child! I cannot find the size guide any more, but the rise is 34cm unstretched. The waist tabs are generous so they'd fit any size child in the waist. Last edited by shinycat on Wed May 21, 2014 12:14 pm, edited 1 time in total. Would you take £20 for the lot all in ? Hello, are these nappies still available? If so, what make are they, do they need a waterproof wrap, and do the inserts tuck inside a pocket or are they like boosters that lay on top? Thank you, sorry for all the questions! Yes still available. The make is Natural Baby, they are no longer available to buy from stores. You do need a wrap, and the booster is a lie-in type. I found them to be very absorbant, and the T-shape means you get a good amount of boosting at the front where you need it. Hope that helps. Are the inserts bamboo too? I am interested in purple and green if they are still available. Hoping they'd be suitable for night time use with my 10 month old. Hi @1nga, yes the inserts are bamboo velour. I would say they would be suitable for night-time use and there is certainly space to add an extra booster if you needed to, depends on how much milk your baby still has at night! Royal Mail prices have gone up a bit since I listed these - £2.80 plus 50p fees = £11.39. Let's make it an even £11. Please PM if interested and I will send my PP details. Thanks! Blue and brown still available, price dropped to £3 each.